Finding the best automatic cat feeder can save time, energy, and money. While cats are intelligent and independent creatures, keeping them inside can prevent them from being able to hunt or feed themselves. A good automatic cat feeder is a great solution to this problem. In this article, we will take an in-depth look at some of the best automatic cat feeder options out there! We will help you find the perfect automatic cat feeder for your situation. With so many available options in 2018, finding the perfect automatic cat feeder may feel overwhelming. Don’t panic! We have thoroughly researched the top cat feeders on the market today so you’ll be able to find a cat feeder that suits all your unique purposes. We have listed some of the most popular automatic feeders, their features, and other additional pertinent information to make your search easy. Knowing which cat feeder you need can go a long way towards helping you narrow down your search. There are essentially three feeders out there. These feeders provide different levels of convenience based on your specific needs as a pet owner. Electronic cat feeders – utilize electronic components to automate food dispensing and regulation. They can be programmed to feed your cat at specific times each day in specified quantities. Some feature a flipping lid while others rotate. These feeders may even come with WiFi, voice recording, and automation. Gravity cat feeders – work with gravity to dispense food on demand for your cat. These are low maintenance self dispensing cat feeders, though they don’t portion meals in most cases. Hybrid Cat Feeders/Other – generally gravity feeders with electronic automation or other components that help regulate your cat’s food in an efficient way. These are a great option for your cats health. Automatic cat feeders come with an extensive range of impressive features and amenities. Features vary based on the cat feeder you choose. Impressive features include timers, regulated dispensing,, voice recording, and even remote or WiFi controls! Below, we will take an in-depth look at some of these features. This way, you can decide what works best for your situation. Custom programmable timers can be set to dispense food at designated intervals. This is great news if you have a cat that tends to gobble down food quickly. Timers can be set to feed your cat once, twice, three times, or more per day and are a great way to keep your cat at a healthy weight. Timed cat feeder wet food products can be equipped to wet and dry food dispensers. If you’re feeding wet food, a timer helps ensure it doesn’t sit out for too long. Some feeders even track or store uneaten food for the next meal. 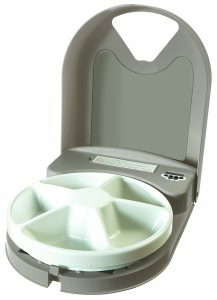 A timed wet cat food dispenser may be a great option for owners trying to simplify their feeding routine. Some automated programmable feeder options will feature voice recording settings. This way, you can record your voice as an alarm to call your cat to dinner. This is a great way to help train your kitty to come when you call it. A voice recording may also strengthen the bond between pet and owner. Distinguishing between battery or corded is important. While a battery operated feeder may be great if used as a multi pet feeder, corded feeder options are generally a better multi day cat feeder choice. Alternatively, if you’re traveling and need to feed your cat in a crate or a kennel, battery operation offers great convenience. They are also great for feeding multiple cats outdoors. If you’re leaving on vacation, however, a corded feeder may be a smart option. Corded feeders are also great for everyday use. Not all automated feeders work with wet or canned food. Gravity feeders that aren’t electronically automated are rarely successfully used for wet cat food. 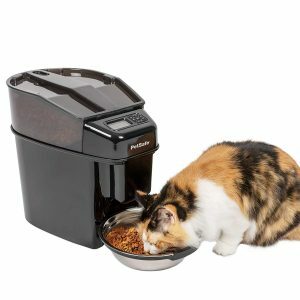 You may need a wet food dispenser that is also an automated cat feeder specifically designed to dispense wet food. A wet food automatic feeder will generally operate using a timer and dishing out specific portions. They may also work with a flipped up lid that closes after a specified time period. These feeders can be a great way to reduce mess, regulate meals, and keep mealtimes efficient and cost-effective. Remember, some feeders may only be designed to be used with specific brands of automatic cat feeder wet food. You’ll want to check the brands and kinds of wet food that can be used with the feeder before confirming a purchase. Many top of the line self-dispensing cat feeder options now use WiFi! 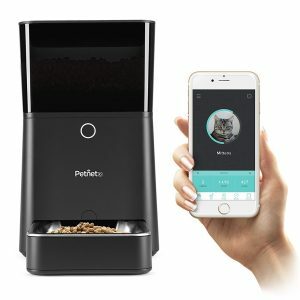 These innovative automatic programmable cat feeder options allow you to feed your cat remotely, watch them from a camera, speak to your cat, and more. A good WiFi pet feeder will usually allow you to download an application that lets you control when and even how much your cat eats. Before you pick out an automated feeder, know exactly what you’re trying to accomplish. Cats are independent creatures which may be part of their allure – they don’t depend on us for survival. If you’ve got a cat or even multiple cats living indoors, you’ll need to provide access to quality nutrition every day. Providing your cat with an automated pet feeder allows them to maintain their independence while giving you a bit of a break as well. Here are a few questions you’ll want to answer before settling on an automatic cat feeder. • Is your cat actually a pig? If your cat is overweight or tends to overeat regularly, you may not want to use a gravity feeder. These are usually better for homes with multiple cats. 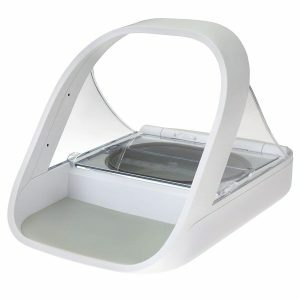 A covered cat feeder with a timer will also usually have a lid that flips up and down, this would be a better choice. • Are you planning on leaving your home for a while? Some feeders hold more than others. Choose a feeder that can hold enough food for the cat or cats if you won’t be home. It may also be a good idea to choose a feeder that can be plugged in for continuous use. A plug in automatic cat feeder option may be best for owners who travel. There are hundreds of of cat feeders available today. Finding the best for your needs can be a difficult and time-consuming process. There are many factors that you may need to consider when choosing your automatic cat feeder. For example, your cat’s size or your personal schedule may be of significant importance. We have meticulously researched and collected data on the top automatic cat feeders available on the market today. Purchasing a feeder that is unsuitable for your cat can have consequences and it’s important to make the best educated decision. This article lists cat feeders designed and developed by some of the biggest names in the pet industry. We have compiled this list of the Top 10 Best Automatic Cat Feeders so you can find the best cat feeder for your individual needs. 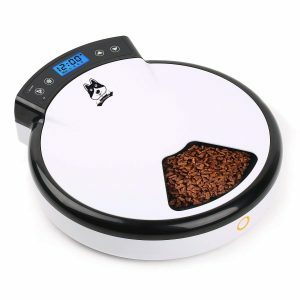 There is also a Q/A section at the end of this article to assist you in your search for the best automatic cat feeder. The PetSafe 5-meal Automatic Cat and Dog Feeder is one of the best remote cat feeders. This cat feeder may be ideal for a cat owner who works outside the home and cannot be at home to feed their cats throughout the day. This cat feeder is electronic and has a digital timer that can be set in one hour increments. 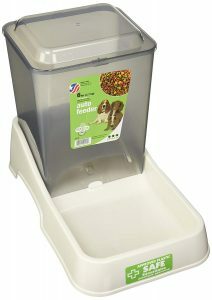 This cat feeder is ideally sized for smaller animals such as cats or small or medium-sized dogs. The food capacity of the feeder is enough for five meals, and this electronic feeder is battery operated which is essential in times of bad weather or power outages. The PetSafe 5-meal automatic cat feeder is a great remote cat feeder for busy cat owners. Its 5-meal food capacity is great for busy cat owners. This feeder is not WiFi compatible and it is not ideal for wet cat food. 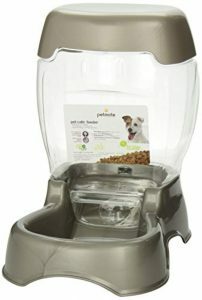 The Petmate Pet Cafe Feeder is non-programmable gravity cat feeder useful for any cat owners with multiple pets. This cat feeder works by automatically refilling the attached bowl as your pets empty the bowl. This process is achieved by gravity feed technology. This cat feeder comes in three sizes: 3 pounds, 6 pounds, and 12 pounds. This PetMate gravity cat feeder may be ideal if you are absent for extended periods since you do not have to be present to refill it. This feeder does not have a timer so food cannot be rationed for pets prone to overeating. The PetSafe Healthy Pet Simply Feed cat feeder is an automatic cat feeder with a timer. It can be programmed for up to 12 meals. This cat feeder is battery operated. The timer has numerous modes for dispensing including slow feed and immediate feed. The PetSafe Healthy Pet Simply Feed cat feeder has a large range of portion size options ranging from ⅛ to 4 cups. Wet food cannot be used in this feeder, but this feeder is easy to use and even easier to clean as it is dishwasher safe. 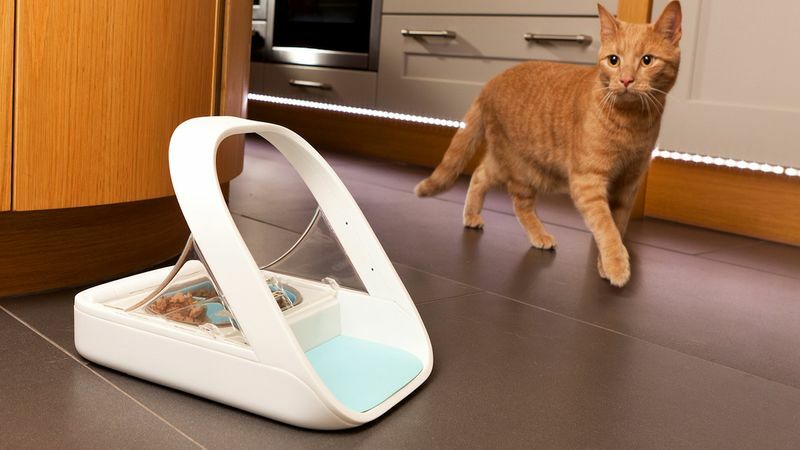 This cat feeder can be used with wet cat food and also allows owners to leave 6-second voice recordings for their pets. This feature can be useful for cat owners whose pets only eat after verbal commands to do so. This cat feeder is designed for smaller animals such as house cats and only has a 6-meal food capacity. 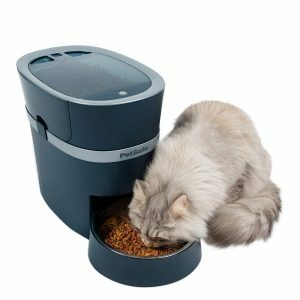 The PetNet SmartFeeder is a dry cat food feeder that has many features you may desire in a cat feeder. This feeder is WiFi compatible and optimized for pets up to 55 pounds. This cat feeder is electronic and has a programmable timer. This pet feeder is compatible with the PetNet app for iPhone and Android users. It is also compatible with Alexa. With this feeder you can receive notifications when the feeder serves your pet’s meals and when food needs to be refilled. 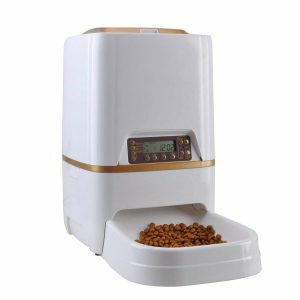 This electronic dry cat food feeder is a great choice if you are looking for an automatic cat food feeder. This feeder can serve animals of various sizes. The SureFeed Microchip Pet Feeder is an electronic multi-pet automatic feeder that works by scanning microchips placed in your pet’s or SureFlap RFID collar tags. 32 microchips can be programmed into this feeder which is perfect for pet owners with numerous animals. The capacity for this cat feeder ranges from from 2 to 2 ½ cups of dry food, and the bowl can fit two 5.5oz cans of wet food. The SureFeed Microchip Pet Feeder can be essential for multi-pet homes. The PetSafe Smart Feed cat feeder isn’t a wet cat food dispenser and is ideal for dry food. This cat feeder is WiFi enabled and has a programmable timer. The cat feeder can be plugged into the wall or battery operated. The timer on this feeder is programmable and comes featured with additional feeding modes such as slow feed and immediate feed. The portions for this feeder range from ⅛ to 4 cups. This cat feeder can hold 24 cups of food. 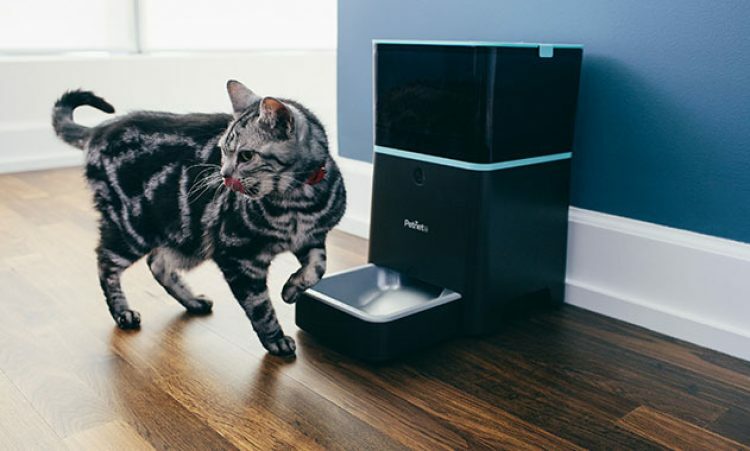 This WiFi-enabled cat feeder requires WiFi to work, but if your WiFi drops the PetSafe Smart Feed cat feeder will continue to feed your pets as scheduled. The Westlink 6l Automatic Pet Feeder is a cat feeder that has vital features many pet owners need. This feeder has a timer, a voice recorder, and is WiFi enabled. This cat feeder has ultra low power consumption and can be used via a usb port or batteries. This cat feeder can be programmed to serve four meals a day. Portions for this cat feeder is ¼ cup. 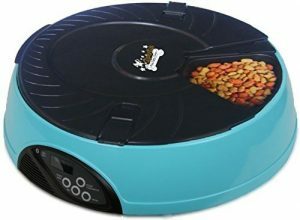 A unique feature of the Westlink 6l Automatic Pet Feeder is it has infrared lights that signals the feeder to stop dispensing food if the bowl is full. This prevents food creating a mess on your floor or being wasted. The TDYNASTY DESIGN automatic pet feeder is an electronic cat feeder that has a programmable timer, a voice recorder, and can serve five meals. The portions for this feeder range from ½ to ¾ cup. This cat feeder is acceptable for cats or small to medium-sized dogs. The TDYNASTY DESIGN automatic pet feeder requires an understanding of military time or programming the timer can be tricky. This cat feeder has a voice recorder that will play a 10-second message three times. This pet feeder can be battery operated or plugged into the wall with a dc adapter. The Van Ness Medium Auto Feeder is not a timed pet food dispenser. This cat feeder is a gravity feeder suitable for animals of a wide-range of sizes, including large dogs. This pet feeder can hold six pounds of food. This automatic cat feeder is easy to use and may be perfect for pet owners seeking a cat feeder that is simpler and gets the job done. The Van Ness Medium Auto Feeder may not be a timed pet food dispenser, but your pets will still be fed. This cat feeder may not be ideal for pet owners concerned with their pets overeating since food will remain available to eat 24/7 throughout the day. There is additional information you may need to know before making your final decision on which cat feeder to purchase. The possible consequences of not choosing the right cat feeder for you and your cat’s needs are not worth skipping the next bit of information. This section provides the last tidbit of information you need to make the right choice for your pets. When choosing the best automatic cat feeder there are some considerations. First and foremost, you need to examine the features of your prospective cat feeder and ensure it satisfies all of your unique needs. You also need to consider your reason for purchase, the size and number of cats, and the dietary restrictions and needs of your cats. For example, if you have a lot of cats you may need a cat feeder with a large food capacity size. Additionally, if you have a cat that is at-risk of obesity you may find a cat feeder with a slow feed mode and timer useful. Lastly, if your cats only like wet food finding a cat feeder that can dispense wet food is crucial. If your cat prefers wet food and would like to feed it accordingly while you’re away, you have two options: freeze it or buy a wet food capable feeder. The first option, freezing your cat’s wet food only works for one day. The way this works is freezing your cat’s wet food then taking it out before you leave ensures it stays fresh throughout the day. The freezing preserves your cat’s wet food. As for the second option, buying a wet food capable feeder, is essential for trips exceeding one day. While wet food capable cat feeders aren’t as common as dry food feeders, the above list gives an in-depth overview of a few wet food capable feeders. For those seeking a versatile cat feeder you can rely on to keep your pets fed and happy while you’re gone, we recommend the PetSafe 5-meal Automatic Cat and Dog feeder. This cat feeder is a good size for cats and small or medium-sized dogs. The digital timer on this feeder can be set in one hour increments, and this automatic pet feeder can serve five meals daily. While this cat feeder was designed for dry food, users have had success using the feeder to dispense wet food. The only issue some users have noticed is wet food dries out while sitting in the dispenser. This can be easily fixed. The solution for this is simply to put a few ice cubes in with the wet cat food. The moisture from the melting ice helps preserve the freshness of your cat’s wet food. We hope you enjoy the best automatic cat feeder. The PetSafe 5-meal Automatic Cat and dog feeder is versatile and affordable, and its battery operation makes it a great choice in case of power outages while you’re away.